Upon arrival in Delhi you will be picked up and transferred to your pre booked hotel. Check in at the hotel. Spend the night at the hotel. In the morning you will be taken on a city tour of Old and New Delhi visiting Qutab Minar, Humayun’s Tomb, India Gate, Rastrapati Bhawan, Parliament Street, Raj Ghat, Red Fort, Jama Masjid and the Chandni Chowk. After breakfast leave for Agra. Upon arrival in Agra, check in at your pre booked hotel. After noon – city tour of Agra visiting Agra Fort and Tomb of Itmad-ud-Daulah. Start your day very early to visit the famous Taj Mahal at sunrise. This is a breathtaking view- the mausoleum was built by a sorrowing Shah Jehan in memory of his young wife Mumtaz Mahal. The building’s stupendous scale, flawless symmetry, translucent white marble and shimmering reflection in the water channel are truly breathtaking. Proceed to Jaipur; enroute visit Fatehpur sikri and Bharatpur. Upon arrival in Jaipur check in at your pre booked hotel. This morning, visit the Amber Fort in the Aravali Hills, which is an excellent example of the Rajput (medieval Hindu) style of architecture. In the afternoon go on a tour of City Palace and the Observatory. The City Palace in the heart of the old city is a blend of Rajasthan and Mughal architecture. The Palace of Winds – a five storied structure of pink sandstone has semi-octagonal and delicately honeycombed windows overlooking the main street of the old city. It was originally built to enable the ladies of the Royal household to watch everyday life. After breakfast, proceed to Chennai by flight. Upon arrival in Chennai, you will be transferred to the temple city of Mammallapuram (also known as Mamallapuram) which is about 60 km from Chennai. Check in at the beach resort. Overnight stay is at the resort. After a leisurely breakfast, go on a sightseeing tour of Mammallapuram visiting Arjuna’s Penance, Krishna Mandapam, Shore temple, Five Rathas and the beach. Overnight stay is at the hotel. In the morning drive down to Pondicherry. 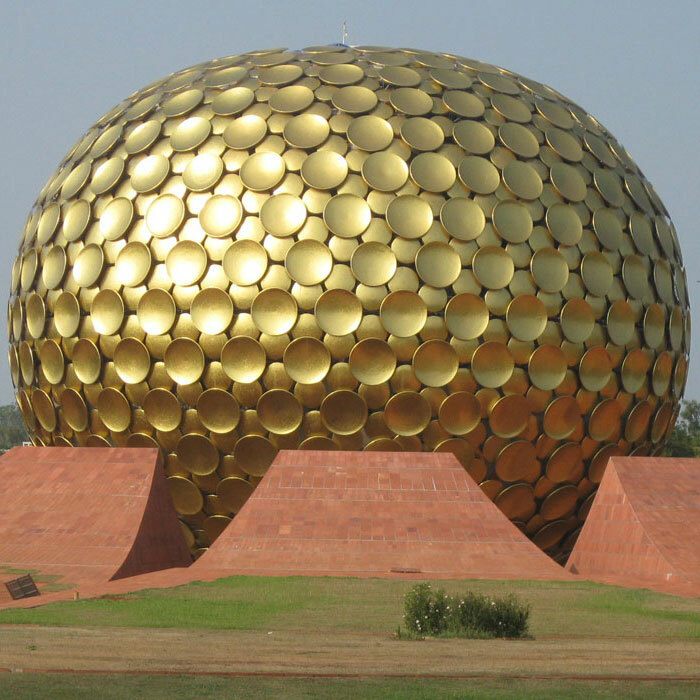 In the afternoon you can visit Aurobindo Ashram and the Museum. Overnight stay will be at Pondicherry. After a leisurely breakfast, proceed for a full day sightseeing of Pondicherry – Promenade and Pondicherry Museum, Chunnambar backwater resort. Return to the hotel for the night. After breakfast check out from the hotel. You will be transferred to Chennai airport; board the flight to Madurai. You will be picked up from the airport and will be transferred to the hotel. Check in at the hotel. Overnight stay will be at the hotel. In the morning, go for a half day city tour of Madurai city visiting the famous Meenakshi Temple & Tirumalai Nayak palace. Overnight stay at the hotel in Madurai. After breakfast, checkout and proceed to Kanyakumari. Check in at the hotel. Overnight stay at the hotel in Kanyakumari. Check out from the hotel at 12 00 noon and proceed to Kovalam; enroute visit Suchindram Temple and Padmanabhapuram Palace. Overnight stay at the beach resort in Kovalam. Check out at 12 00 noon and proceed to Alleppey. Check in at the resort; rest of the day is at leisure. Dinner and overnight stay at the resort. After breakfast, full day is at leisure at the resort. Enjoy the facilities at the resort, overnight stay at the hotel. After breakfast, check out from the resort at 11 00 clock and check in at the houseboat. Enjoy the magic of the backwaters by going on a Houseboat (Kettuvallam) cruise across the backwaters. Spend the next 22 hours in your floating villa; get a glimpse of the village life at close quarters; a unique and unforgettable experience. Enjoy the sunset & stay overnight on the houseboat. Breakfast, lunch and dinner included. Check out from the hotel & proceed to Thekkady. Check in at the hotel; enjoy the facilities at the resort. Overnight stay at the resort. Half day is at leisure. In the afternoon go on an evening game viewing cruise on the Periyar Lake. Here you will be able to see a large variety of wildlife, which include elephants, monkeys, deer, wild boar etc, and quite a lot of unique birds can also be spotted. Return to the hotel; relax & enjoy your stay overnight. Check out at 10 00 clock and proceed to Munnar. Check in at the resort. Dinner and overnight stay at the resort. In the morning, you will be taken on a sight seeing trip of Munnar covering Blossom Park and Tea museum. After lunch from a local restaurant (own arrangements), proceed for a sightseeing trip to Mattupetty, Kundala and Eco point. Evening is at leisure. Dinner and overnight stay is at your hotel. Check out at 12 00 noon and proceed to Kochi. Check in at the hotel. Overnight stay at the hotel. In the morning go for a city tour of Cochin visiting Jewish synanogue – the oldest synanogue in the entire commonwealth, St. Francis Church, St. Mary’s Cathedral, Cochin Harbour Terminus, Chinese Fishing Nets, Mattancherry Dutch Palace built by the Portuguese known for its murals depicting scenes from the Ramayana and the Mahabharata and dresses and palanquins used by Cochin’s erstwhile rulers. In the evening, experience the Kathakali dance show. Today you will be transferred to the railway station for your journey to Goa. Overnight in the train. On arrival at Madgaon(Goa), you will be transferred to the hotel. Rest of the day is free for you to relax at the beach. In the evening enjoy the Goan Carnival theme, which is a part of Goa’s rich Portuguese heritage where revelry, song and dance, great food and good wine come together beautifully. Discover the joy of Goan cuisine at a delightful buffet dinner. Over night stay at hotel. Today you will explore North & South Goa. In the evening we have for you the Fishing village: that are part of Goa’s rich cultural heritage. Local Goan fishing village is created on the grounds of the hotel, forming a perfect backdrop for a charming evening in a very rustic atmosphere. Artisans display their skills whilst the village dancers whirl to the music of a local band. Over night stay at hotel. Today you are free to relax on the beach. In the evening, enjoy the Seafood Bar-be-cue on the beach – Dine under a starlit sky on succulent lobsters, jumbo prawns and other local seafood delicacies. Guests may also cook their own food on skewers over a campfire. A local musician captures the magic of the moment on his guitar strings. Over night stay at hotel. After breakfast, get ready for your onward journey home.